Everyone knows a few trees. However, usually we are unaware of the huge diversity of trees surrounding us. 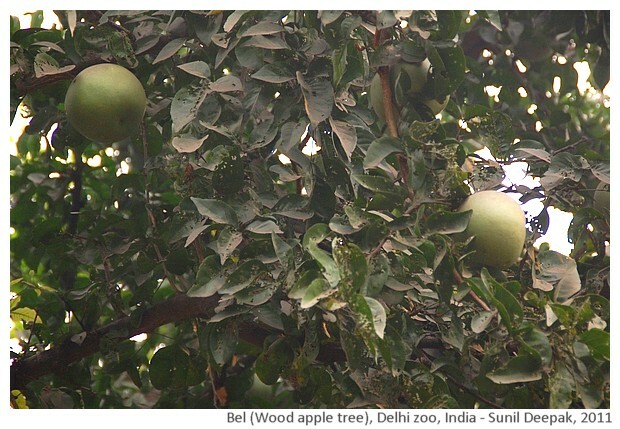 I found that Delhi zoo can be a good learning place about Indian trees. 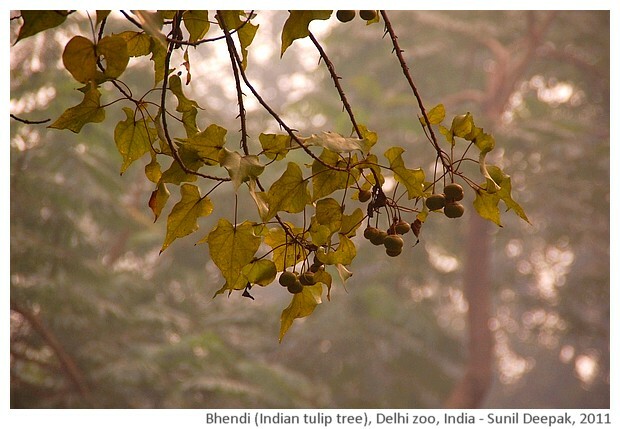 This photo-essay presents a few trees from the Delhi zoo which have stories behind them. I became interested in trees because of our dog Brando. Whenever I was at home, it was my responsibility to take him out for his morning and evening walks. Our house in Bologna (Italy) is close to a beautiful park. During the walks, while Brando sniffed and did the things that dogs are supposed to do during their walks, often I waited and looked around. Inevitably, I also looked at the trees. Slowly I realized that I hardly knew any of their names. So I bought a book about trees. Then for a few months, every time I went out with Brando, I learned to identify a new tree. I observed the shapes, colours and number of the leaves and the way they were arranged, the quality and colour of the bark, their flowers, fruits and seeds. Now I can identify a lot of trees in that park. 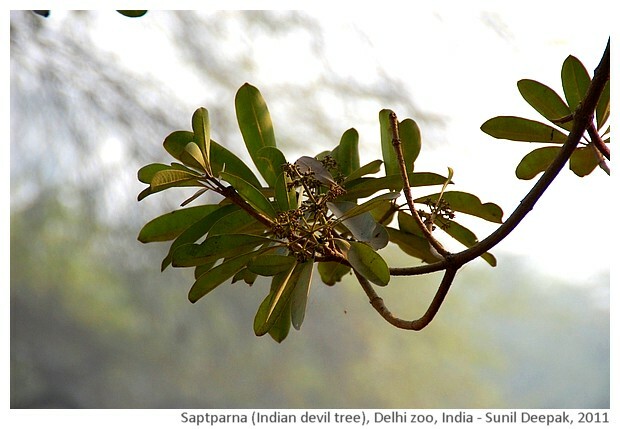 A couple of years ago, when I was in the Delhi zoo to look at my favourite birds (the painted storks), I realized that most trees in the zoo carry little boards with their popular and botanical names. So I spent some time looking at the trees. This post presents some of those trees! All trees have botanical names (in Latin), composed of two words - often the first word is about the tree family and the second word is the name of the person who discovered it or name of the place where it was found, etc. If you want to search for information about a tree, knowing the botanical names makes it much easier. So let us start this journey! 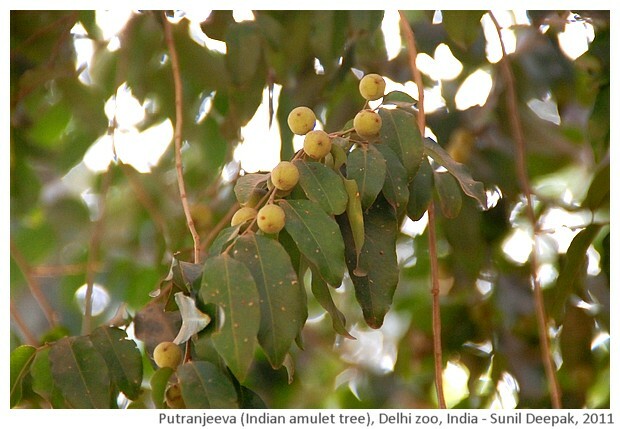 Putranjeeva tree (Tree for a son's life): The botanical name of this tree is Drypetes roxburghii. The tree has round hard fruits. This tree is native of India and some other Asian countries. It was taken to Africa and now it grows in many parts of that continent. The round and hard seeds of the fruit can be used for making necklaces. Another name for this tree is "Indian amulet tree". I don't know if this means that mothers make amulets from its seeds or the name denotes that it is useful to cure illnesses. Its name also made me think of the Indian bias for sons - why did they not call it the tree for a daughter's life? It is also called "Spurious wild olives tree" - probably this only means that the fruits look like olives but they are not. The tree itself does not look like an olive tree. According to Ayurveda, a decoction of its leaves and fruits is useful for treating fevers, malaria and for liver problems. Saptparna Tree (Seven leaves tree): The botanical name of this tree is Alstonia scholaris. The name of the tree refers to the leaves that form flower like whorls in usually in groups of 7 leaves (can vary from 4 to10). When I saw the name of this tree I was reminded of a Bengali fairytale I had heard in my childhood - about seven princes who were killed by the stepmother and who became champa trees. When ever the stepmother wanted to hurt their sister, the princess, her brothers in the champa trees warned her, "Saat bhai champa jago re, jago re" (Seven brothers of Champa, wake up, wake up). In English they call it the Indian Devil Tree. Normally, solitary and secluded trees are considered the trees possessed by the devil and if you sleep near them, it is said that they can steal your soul. However, I find the Indian name of this tree completely incompatible with the English name - almost as if we are speaking of two completely different trees. Another name of this tree is "Indian blackboard tree". Does it mean that it's wood was used for making blackboards in the villages? Is it because of the black coloured boards that the British started calling it the Indian Devil tree? According to Ayurveda, it is used for treating skin diseases, malaria, diarrhea, snake-bite and for punchkarma purification. Kanak champa tree (wheat flowers tree): The botanical name of this tree is Pterospermum acerifolium and in English they call it the Dinner-plate tree. I think that the British must have seen the Indians putting together 2-3 leaves and making organic plates out of them. There was a time when we use to get most of the roadside food (Tikki, Golgappas, chole-bhature) in India in such organic plates, though now, most roadside shops in Delhi seem to use plastic plates. Obviously using plastic means creating plastic waste that damages our environment, but I wonder if destroying trees by excessive use of their leaves for making plates would be a less damaging alternative? What do you think? It name Pterospermum refers to its Maple (Acer) like winged seeds. It is also called Maple-leafed Bayur tree though I must say that its leaves do not seem to be like the maple tree! According to Ayurveda, its leaves and flowers are good for treating inflammation, ulcers, blood problems and even tumours. Flower extracts are also useful as insect repellent. 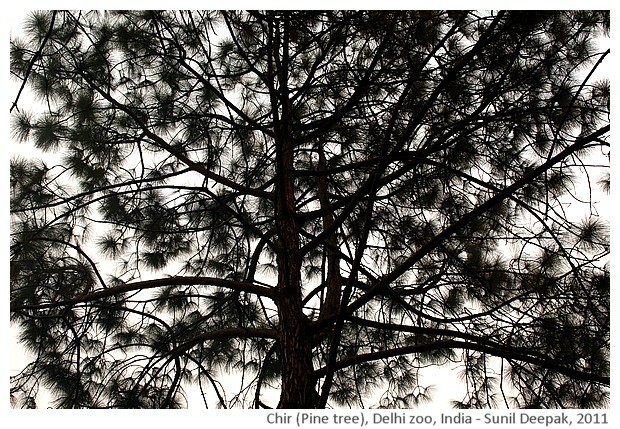 Chir (Pine): The botanical name of this tree is Pinus Roxburghii and it is one of the common Pine trees in the Himalayas. I found its name special because it reminded me of the Nirmal Varma's Hindi book Chiron par Chandani (Moonlight on pines). If burnt, sometimes the resin in its wood solidifies into a hard translucent material that does not get wet and is useful for starting fire. In Garhwal they call this hard colourful resin as Jhukti. It burns for a long time so if you are travelling in the hills, it could be useful to keep some Jhukti with you. Bel (Creeper) or Shree Phal (Fruit of divine light): The botanical name of this tree is Aegle marmelos. In English they call it Stone Apple or Wood Apple, because of the tough exterior of its fruit. The leaves of this tree are necessary for two kinds of swallowtail butterflies. The leaves are also good for human consumption. The fruit-pulp is very aromatic and the juice is tangy and astringent. It is used for making sherbets such as Bela Pana. The fruit takes almost a year to get matured on the tree. According to Ayurveda, this fruit has different medicinal uses including for gynaecological problems, urinary problems, liver problems, etc. For Hindus it ia sacred tree because it is the tree of Shiva and the fruit is used for prayers in Shiva temples. The trifolate leaves are considered as symbols of Shiva's trident. Among the Newari famlies in Nepal, there is a custom of marrying the girls to the Bel tree (Bel Baha). Plaksa or Bhendi: It's Hindi name sounds like that of the vegetable, okra. Its botanical name is Thespesia Populnea. In English it is called the Indian Tulip tree or Portia tree. In Sri Lanka they call it Suriya (sun). It is important because of its wood that is greatly appreciated for making furniture and musical instruments. 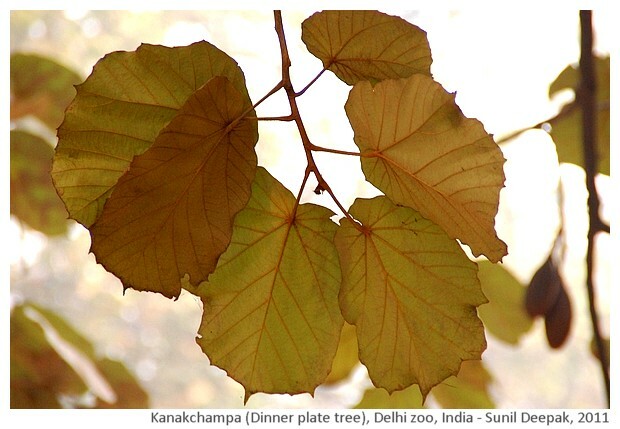 Makhan Katori (Butter bowl) or Krishna badh (Krishna's fig): The botanical name of this tree is Ficus krishnae. It belongs to the Ficus (fig) family of trees which is very popular in India specially as the Ficus religiosa (Pepal tree or sacred fig), under which Buddha had attained illumination. 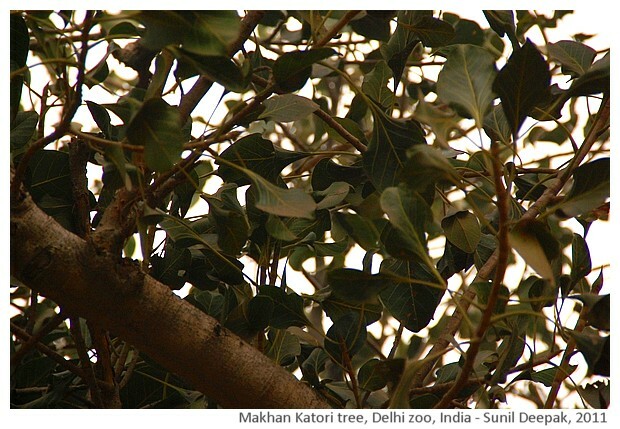 Compared to Pepal tree, the leaves of Makhan Katori seem darker and thicker. Their unique feature is that they have a pocket like structure at the base. It grows into a large tree. There is a story associated with this tree -when god Krishna was a baby, he was very fond of butter and often stole it. Once when his mother Yashoda caught him stealing, he tried to hide it by rolling it in a leaf of Makhan Katori. Since then, the leaves of these trees have a folded shape at the base. Kadamba: There is some confusion about the botanical name of this plant. Its name plate in Delhi zoo called it Anthocephalus chienensis but Wikipedia says that its correct name is Noelamarckia cadamba. It is loved for its round ball like sweet smelling flowers that can be orange or yellow. These flowers are used for making traditional Indian perfumes including Attar. The leaves of this tree are necessary for the larvae of brushfeet butterfly. Its wood is used for making plywood, paper pulp, simple canoes, etc. The extract of its leaves can cure intestinal parasites. 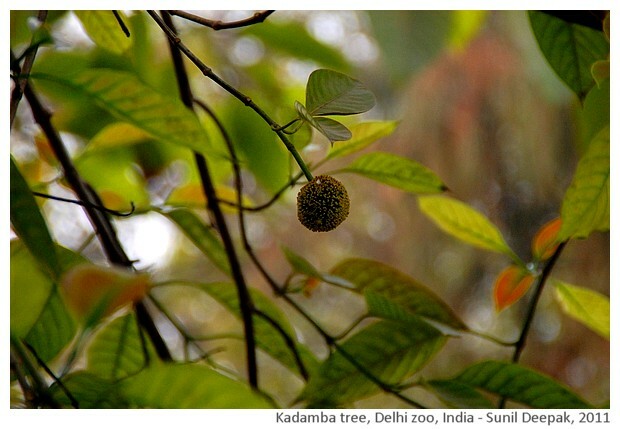 The Kadamba tree is part of different mythological stories in the north and south of India. Kadamba is mentioned in the Bhagavata Purana. In Northern India, it is associated with Krishna - Radha and Krishna are supposed to have conducted their love play in the hospitable and sweet-scented shade of the Kadamba tree. In the south it is known as "Parvathi’s tree". So I hope that you have liked this brief journey with some trees. The next time you look out of yur window or you go out for a walk in the park, ask yourself if you know the names of the trees you see! Excellent ... Thanks for collating this rather rare Info.